SRPM is a small production job shop located near Cleveland, Ohio. It primarily serves the electronics, semiconductor, power sports and communications industries. Most of the work the company does is in new product development, in aluminum, and often involves large hog-out routines coupled with close-tolerance detailed work on the same part. It’s not unusual for SRPM to take a 90-pound billet of aluminum and mill it down to 17 pounds. 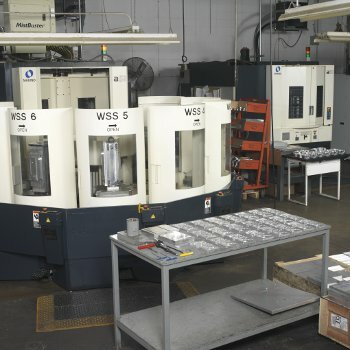 The company needed a reliable horizontal machining center that could handle the large volumes of chips produced during hog-out procedures and that would not break down frequently, like its previous machines. SRPM usually handles batch runs from 5 to 5,000 pieces and often has to interrupt work to let priority jobs be completed first. It wanted a flexible solution to accomplish this goal. It was also seeking the capability to run unattended, because its staff is stretched thin with the shortage of skilled labor in the marketplace. SRPM purchased two Makino a51 horizontal machining centers with an eight-pallet magazine system and 219 tools. This solution would replace its previous horizontal machines in the hope to make SRPM’s processes faster, more efficient and more accurate. With the eight-pallet magazine system and large tool capacity on the a51 machines, operators can set up a rush job and, when it’s completed, return to a previously scheduled job within minutes. With this flexible solution, the company is experiencing a huge timesaving not having to re-setup parts. Additionally, the Makino a51 does not get clogged with large volumes of aluminum chips that are created during hog-out procedures, and the design of the way covers eliminates many potential failure points. This machine has enabled SRPM to achieve the reliable machine uptime it needs, while giving it the ability to handle short- to medium-run parts. The a51 machines help SRPM finish its parts quickly and correctly the first time. Because they are so precise, the a51s eliminate the need to purchase high-precision boring tools along with the time required to change them out. The company’s unattended capabilities as well as the auto-tool management feature of the a51 have also reduced labor and human error, and the BTSOMA tool-breakage sensor successfully manages the tools. SRPM finds itself being more profitable on smaller runs thanks to the pallet system reducing the need for skilled labor and maximizing the amount of time the spindles are running. Revenues have improved by 20 percent since implementing this flexible solution, with an increase in uptime and capacity, and a decrease in lead-times.